One in seven women and one in 10 men experience postnatal depression and anxiety after the birth of their baby. It’s a serious and often crippling condition, but there is another, more dangerous mental illness that is less widely known, and it’s called postnatal psychosis. Also known as puerperal psychosis, postnatal psychosis is a very serious mental illness which, like postnatal depression, can present shortly after a woman has given birth. The symptoms are much more severe, with a new mum often experiencing delusions, hallucinations, a big change of character, suicidal thoughts and a sense of having lost their grip on reality, all of which can put their life and that of their baby at risk. 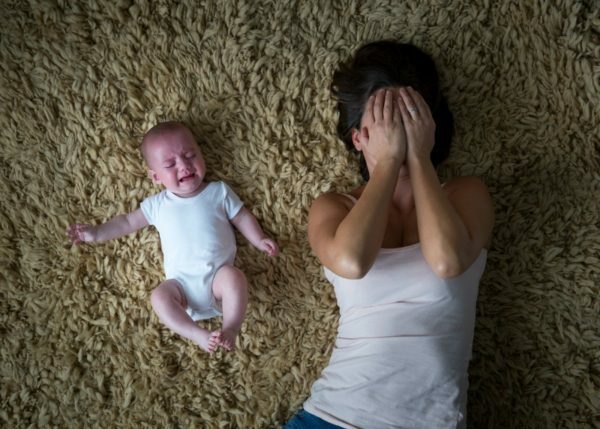 Terri Smith, the CEO of Perinatal Anxiety and Depression Australia (PANDA), says around 1 in 500 mums develop a full blown case of postnatal psychosis, that almost always results in the mother being admitted to hospital. As is often the case with psychosis, the mother doesn’t realise anything is wrong, and this frightening mental illness often goes undetected and without treatment. “Postnatal psychosis is one of the best kept secrets in the whole motherhood business,” says Terri. The cause of postnatal psychosis is still unknown, but women who have experienced it previously after the birth of a child, or who have a bipolar disorder, or those who have a family history of either condition, are more at risk. But it can also develop in women with no prior history of mental illness. While some women experience postnatal psychosis after the birth of all of their babies, for many women it will occur only once. It is believed the hormonal changes during childbirth coupled with extreme sleep deprivation could also be contributing factors, and for a small percentage of women the condition is the first sign of bipolar disorder. Symptoms of postnatal psychosis usually occur within the first four weeks after childbirth, but in some cases they can take up to 12 weeks to manifest, with many of the signs not recognised until even later than this. Changes in the mother can be sudden and dramatic and come as a complete shock to those around them. Terri says that while some mums reach out to PANDA or other medical practitioners for help, in most cases it is the woman’s partner who recognises something is wrong and seeks help. “The mother is kind of doing okay because she can’t identify what’s wrong, she ‘knows’ what she’s doing,” says Terri. This is why it’s extremely important for loved ones and partners to be aware of the signs and seek help immediately if they see them in a woman who has recently given birth. Due to the dangerous thoughts and impulsive behaviour a mother with the condition may have, it’s treated as a life threatening medical emergency. “Women need to be hospitalised pretty quickly because babies can be at physical risk. It’s the scariest thing for everyone and often these women won’t remember what’s happened afterwards,” adds Terri. While it’s a severe, life threatening mental illness, postnatal psychosis is treatable and not permanent. Women with postnatal psychosis will almost always require an urgent admission to hospital to receive a specialised psychiatric assessment, medication and other treatment and care. Once it’s deemed safe for them to be around their baby and on their own again, they will be allowed home with ongoing treatment and therapy required until no longer necessary. Terri says it’s a very tough time for the new mother, partner and other family members. The good news is that with time and ongoing support women generally do make a full recovery and are able to become the mother they originally thought they’d be. Terri believes that the more people talk about mental health issues, such as perinatal depression and anxiety and postnatal psychosis, the more mums and families who are struggling or in danger will get the support they so desperately need. “I don’t think there’s a transition in life that’s as challenging as becoming a parent, although it’s also the most natural thing in the world. Add a mental health issue to that and it becomes even more complicated,” says Terri.